My apologies for the long interlude between posts. Sometimes we just need to hunker down and focus on the core activities, and that’s the way it’s been around here for a while. The question has been what would impel me to write a new blog post, other than clearing out of the local impediments. 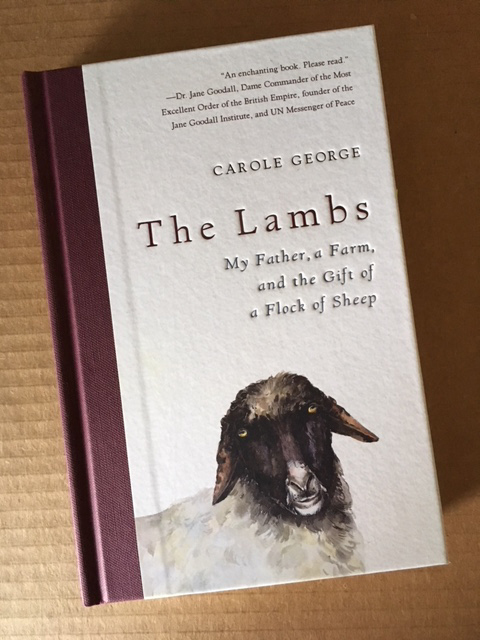 Then I found this book: The Lambs: My Father, a Farm, and the Gift of a Flock of Sheep, by Carole George. I bought it in spite of an excerpt in a recent newsletter of The Livestock Conservancy, which printed a section talking about Persian lambskins, a topic I only think about when I absolutely must. Because of my avid interest in sheep breeds, though, and the mention of a Karakul flock and some research into their history, I went online with my local independent bookstore to order a copy of this very newly released title—and learned that they had one in stock. When I went to pick it up early the next morning, they hadn’t pulled it for me yet, and the staff mentioned that it was in the parenting section. Parenting?? Well, only sort of. . . . The publisher has not put a category on the back cover, as is quite common, so the bookstore really doesn’t have a clue, and the Library of Congress Cataloging in Publication data says Lawyers—United States—Biography. The Library of Congress call number puts it in K (law) F (United States). The Dewey Decimal classification is the only one that places this book accurately, with 630, which is agriculture. The other correct alternative would be memoir. Good luck finding this book if you’re just browsing: yet if you are in the mood to have your mind expanded in a contemplative way, do make the effort to discover it! Cover of The Lambs by Carole George. The only way in which lawyering has anything to do with this book is that a successful career in international law allowed the author to earn the resources that let her carry out the life-experiment that she relates. My first inkling that I might enjoy the book came from its physical presentation. The modest volume has been designed and manufactured with extreme care. It is pleasant in the hand and to the eye. Physically, it’s a candidate for the short shelf of “must keep” volumes. Although I tend to skip blurbs, preferring to encounter a book without filters (and with a slight mistrust of laudatory statements anyway), the number of extremely busy and thoughtful people who took the time to share their comments on this title also gave me both pause and hope: the Dalai Lama, Jane Goodall, Marc Bekoff, Edward O. Wilson, Frans de Waal, and more. Perhaps this is the result of an international law career, but it’s still remarkable. Most of all, I needed some reading that would give me respite and would change my perspective. From a chore, this selection was moving toward promise. Carole George bought and moved to a farm in Virginia. Her beloved father visited regularly from Montana, and declared that what the place needed was sheep. Knowing nothing about the animals, she acquired and lived with a flock of Karakul sheep for the next approximately decade. They were not livestock but compatriots—she talks of them as “pets,” to distinguish their lives from those of others of their species. The author and her father both enjoy poetry, the classics, music, and primary research, which in this account are blended with the delights and heartaches of living with and caring for the flock of thirteen, then eleven, then, gradually, fewer sheep, and of how to responsibly and respectfully share both space and time. (The sheep are named after composers and there’s a piano in the barn.) It is seasoned with well-captioned and loving photographs, which feel intimate but not intrusively so, in part because they are printed on the cream-colored uncoated stock used for the text. The typography is a simple delight, and there’s an extensive bibliography, although the research never burdens the narrative. I’m very slightly envious of the paths the author’s life has taken that opened the space for her to have, and to tell us about, this experience. At the same time, I’m grateful for the life that I do have and the ways it has shaped my approach to the world. I’m also thankful that she has reminded me of the open spaces an awareness of history and of the poetic frame of mind can create. Instead of an “I really should read this” book, it became the one I needed but didn’t know about. The clouds are an incandescent white, and yet I can smell Debussy’s vaguely almond scent. Saint-Saëns’s wool carried a richer burnt sugar fragrance, and I can smell it now, too. I have often thought that even if I were blindfolded I would be able to distinguish the texture and the scent of each lamb’s fleece. I felt the same as you, Deb. Carole’s relationship with her sheep was special as was her relationship with her father. Just reminded me in a pleasant way about the symphony of life.